Here’s part two of my Top 5 posts, in which I try and assemble my thoughts into some kind of coherent jumble. It’s a long shot at best. Top 5 Reflections: What did you learn about yourself or sewing this year? The more time and thought I put into a garment, the more I enjoy it long term. It’s hard balancing the want to dress the family quickly, as opposed to buying ready made clothes, and the quality that makes it worthwhile. I completed my Seamless pledge, and it was fairly easy. What’s difficult, which I didn’t expect was trying to go back to RTW. Going to sewing social, however many projects I bring, I will only AT BEST do a third of that. It’s a pretty good reality check between how fast I think I sew, and my actual speed. Nothing teaches you faster than practice. All the blogs in the world won’t replace the feeling of fabric under your fingers. It took 8 versions of Jalie 3133 to finally nail it to a quality I loved, no matter how many tutorials I read. My UFO list is getting outrageous. I might enforce a finish ban before starting anything new…. 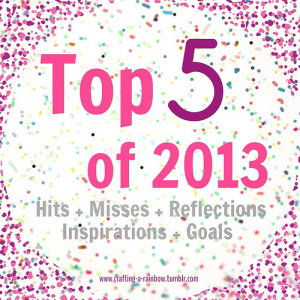 Top 5 Inspirations: What books, people, blogs, trends etc motivated you this year? The sewing of my friends. Nothing is more inspiring than seeing what people are sewing at social sewing, on Twitter and seeing different tips and techniques and versions of garments. The different thinking and way that people sew also challenges me to try different methods, i.e. fast finishes versus couture methods. This has been fascinating as the lure of technical projects is very much influenced by watching Poppykettle sew, and also balancing that with using sewing as a practical means of ethically dressing myself (and increasingly the family) is driven by Funkbunny, Mymessings and Unique Schmuck. *Internet free days aren’t really an option when you run an online store, but not checking your email every 20 minutes IS an option. Technical sewing (books). I’ve admitted before I read sewing patterns on the train. Aside from feeling a little like Dumbledore reading knitting patterns, I like to make my own notes about how I’m going to tackle a project of any modifications I’m planning on doing BEFORE starting these days. Having learnt from experience working as a advisor in a large consulting firm full of specialists, in my role as a “be all advisor” you can never stop learning, or know everything about a subject matter. However having a broad understanding of the concepts and the practices out in the field means that when you do encounter an issue, a lightbulb will hopefully go off and you can refer to a subject matter expert. Sewing is exactly the same. Gertie is my go to for vintage patterns/techniques. Colette for the basics, same as readers digest (mine is the 1970’s version). My sewing machine manual is INVALUABLE. You know what else is? My local library. I’ve borrowed heaps of amazing sewing books like pattern magic from my little local library. Now I just need a full collection of Susan Khalje books…..
Craftsy. The couture dress class has changed my life. So has the fitting class. AMAZING. I learn visually and verbally best, so this is an amazing platform of learning for me. It is my dream to attend a Susan Khalje class, but my skills need SO much work to really get the best out of such an opportunity. Designsponge. I like Grace and her ethos, not all the posts are for me but I find generally it’s fairly inspirational for a simpler, more decluttered life with quality things around me, and to support local and independent as much as possible. It’s not the easiest way to live, but it makes us all happier. Side note, I’ve been decluttering the house while nesting, and it’s STILL full of stuff. The volume of things I’ve thrown out has been astounding, but it feels SO good. I’m determined that we should do it twice a year as a family, and that will drive us to accumulate less. One. It really is time to finish all those UFO’s from last year and new UFO’s. Notice anything about that list? Nearly everything on there is for other people. Naughty isn’t it? The only two things really for me that haven’t been completed in a timely fashion is the pavlova blouse, as I picked a terribly hard fabric to work with, and the lady grey coat which also has a poor fabric choice. So that’s the real challenge while I sit around waiting for this baby to arrive, finish UFO’s and work on the new website. Two. 2014 has a focus on two speed sewing. Quick quality basics, and high quality beautiful classic designs. 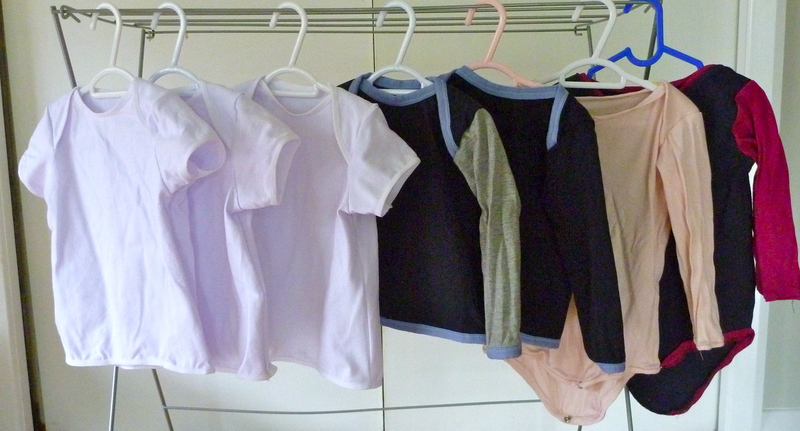 We all have those tried a true patterns, for basic t-shirts and simple items, and I’m planning on making sure to keep the family stocked in those. 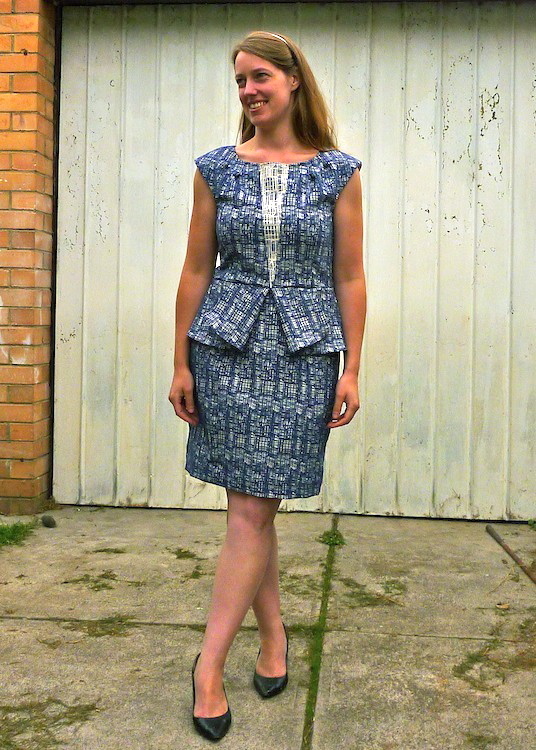 The other items I want to sew are things that might take a bit more time, but use beautiful fabrics and proper sewing techniques and are finished to a high standard. Mel of Poppykettle is really starting to rub off! I’d like to do sewing lessons again later in the year to really pull the standard of my sewing to a better level, and then feel more confident spending more money on super high quality fabrics. Three. Finish a couple of craftsy courses. 8 classes, and only one finished watching. I’ve rewatched lots of sections of certain courses, but not actually made the projects and gotten to the end. My enthusiasm did not match my spare time last year. Nearly all the watching I did, was on the train commuting to and from work. It’s kinda hard sewing along on the train. Four. Sew for my husband. The ratio of fabric proclaimed to be shorts/t-shirts/hoodies etc to finished garments is staggeringly poor. I get some patterns to muslin stage, get him to try it on…then they disappear under other projects or need alterations….blah blah blah. He should be the easiest one in the family to sew for, yet gets the least number of garments. Unlucky. (His total finished garment tally is 2 – and they aren’t even wearable in my opinion. He kindly wears one, and asks for more, but maybe next time with a less wavy neckline. That t-shirt should be in flashdance it’s that stretched out on the neckline). Five. Be kind to myself when I’ve got two small kids and no time to sew. It will pass, they will grow, and it’s perfectly fine to pack away the sewing machine for a couple of months. I’ll leave out some hand sewing to do, now I think about it…there are some english paper pieced hexagons half done which might have been left off my UFO list…..
How did I go against prior years goals? Hmmm, I think the practical aspect worked, but the beautiful is something to keep aspiring to. Much of my sewing recently has been all practical, and the challenge of making something beautiful is something to keep aspiring towards. EPIC FAIL. The curtains, three quilts and that lady grey are still outstanding. I’m trying to spend time at home sewing before this baby comes clearing away this UFO list. The Lady grey as well, it needs some rework which is causing epic procrastination, but it will be worth it when it’s done. Well, apparently I blogged 33 times last year, which considering what a crazy year it’s been, I totally forgive myself. You do too right? I totally need to do this more. We’ve been more focused on domestic charities this year, and considering how much international aid Australia no longer is contributing, I should stump up and help represent. This, is kind of a win. While my poor husband is still waiting on a wearable finished garment (any garment really), the little one got a bonanza of outfits. She’s just gotten to the age where she doesn’t grow out of things immediately, so it’s more worthwhile. I’ve repaired many more things, although I’ve got to stop repairing sheets with quilting cotton. There are all these tiny little colourful circles all over the sheets (from the cat sleeping/clawing at the bed). 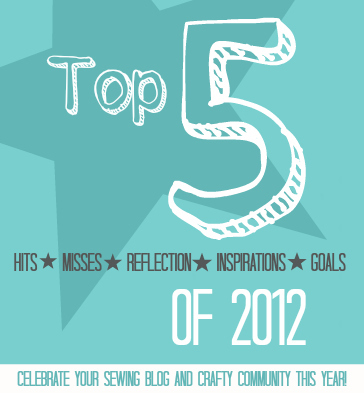 This year, I’m going to take a self created award for the latest Top 5 post! As you will see in part two (up tomorrow), this is one of my goals, to be kinder to myself. It’s been 40+ degrees, I’m 8 months pregnant and working hard on the sewsquirrel pattern store. Taking blog photos has been a VERY low priority. Gillian has put out the call for the top5 lists, and while mine is a little late to the party, it’s so good to take the time to reflect. I find it especially interesting to compare people’s 2013 Top 5 lists to their 2012 Top 5 lists. It’s amazing how much we can improve and challenge ourselves (and also ignore the ever growing stash). This was a fantastic mix of print and pattern, and this has been washed and worn so many times it’s faded grey. In fact the black faded before any of the print, and I would still wear this around the house/locally if it fit at the moment. 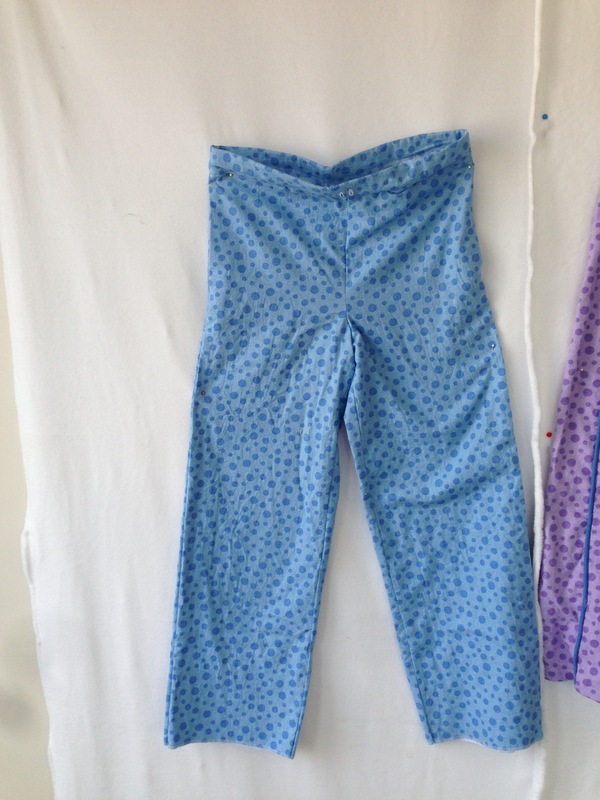 This pattern is comfortable, easy to make and looks great. It’s well suited to a firmer knit fabric, so I’m tempted to get a similar weight interlock and make another. The Sewaholic Hollyburn got so much use, it looks fantastic on, and while skirts with firm waistbands aren’t my first preference, this made me a bit of a convert. This was a really win as it was easy to sew, and the fabric had that mystically perfect amount of drape. 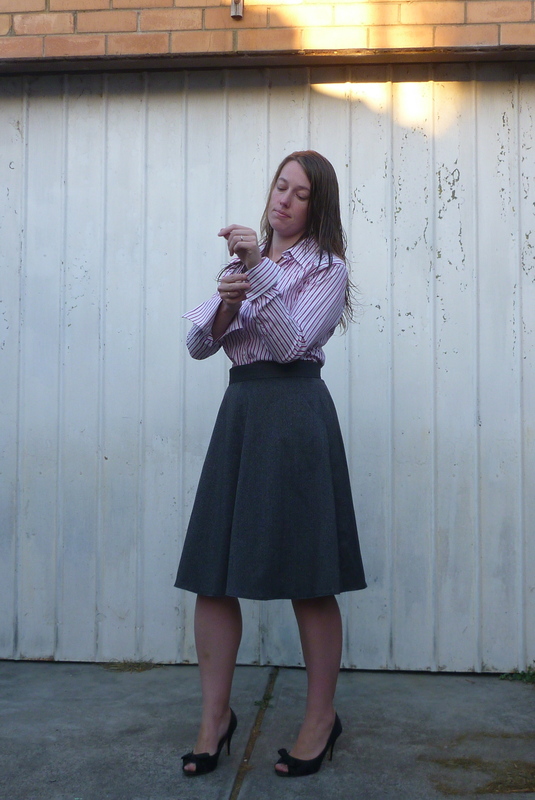 The hollyburn for me was a Work outfit, and as such the pattern probably won’t see much love in 2014 while I’m at home. This dress was a matter of personal pride, and has only been worn twice in 2013. It was a labour of love, with hand basting and well, lots of tiny hand stitches everywhere. It’s was the most time consuming item sewn in 2013, and dang it I’m proud. 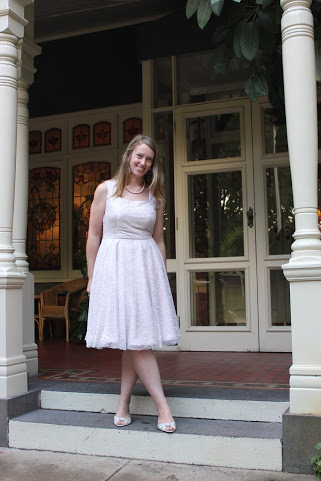 This dress gets a mention for three reasons, one being that I actually finished it in time for a competition, two being that I tried a new style for me (based on the best use of the fabric – and I love it), and three, I wore this all the time to work! Picking the pattern for the fabric meant I was really pleased with the final result, and as it’s handmade the style suits as it’s fitted properly. Sometimes it’s hard to get past the RTW mental blocks of certain styles not suiting you. 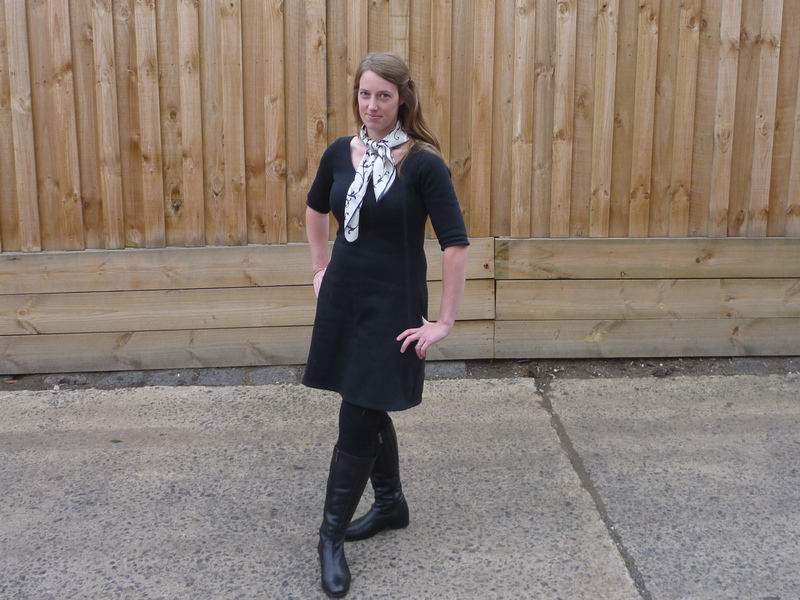 This Audrey dress was meant to be a wearable muslin, and was whipped up using jumper fleece. It reminds me of my primary school jumper, and dang it was comfortable, washed well and was suitable for most occasions. This dress was like not wearing anything at all, and incredibly warm. A most honourable mention goes out to my Tofino pjs, which is one of the few items I wear with my giant preggo belly, and the final versions Jalie 3133, which is pretty much R’s childcare uniform. At last count she has about 8 in high rotation in her wardrobe. This gorgeous silk is from Astratex in Richmond, and it was a total splurge. It was about $50 for two metres, and was SO far out of my skill level. I love the pavlova pattern by Steph of Cake Patterns, but the damn slippery silk was just out of my depth when I tried it. 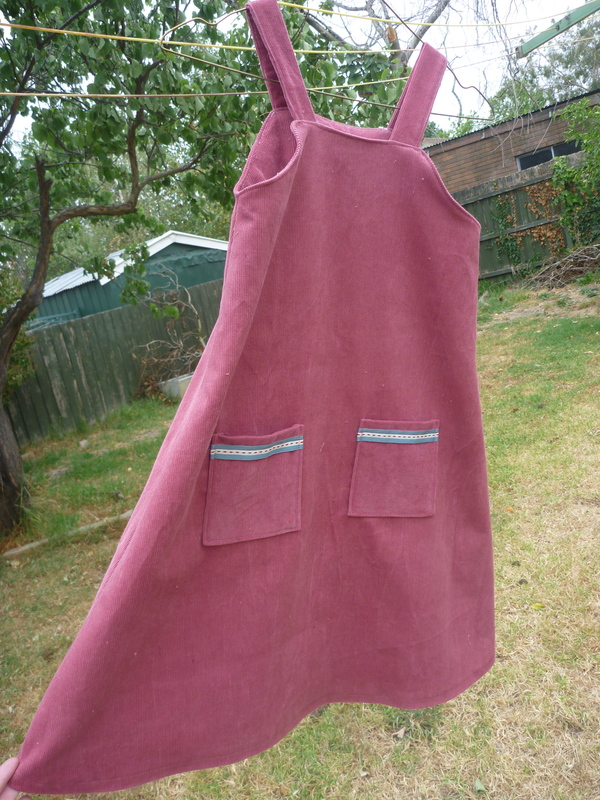 It still needs to be finished, but I’m thinking of just calling it a wadder and trying again with some silk georgette. It’s unfinished, barely recognisable and all around I made a hash of it. I’m going to try this again with a knit. This cord dress was the first thing I’ve made in corduroy, and while it was cute the fabric didn’t really suit the pattern. 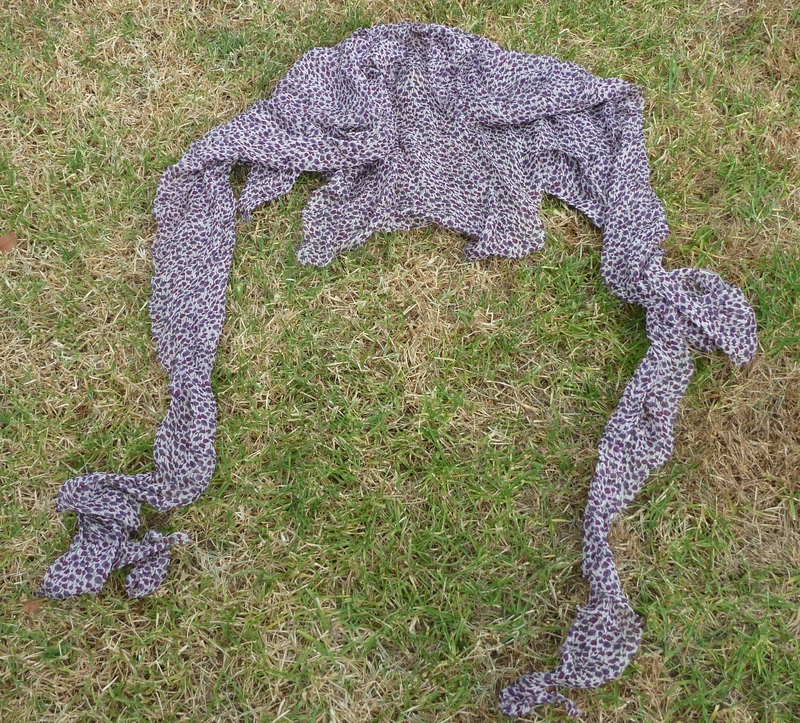 Also, the finish was not brilliant as I should have done lots of test stitches and overlocking…and didn’t. It was a good lesson on researching fabric before sewing. *Sigh*. 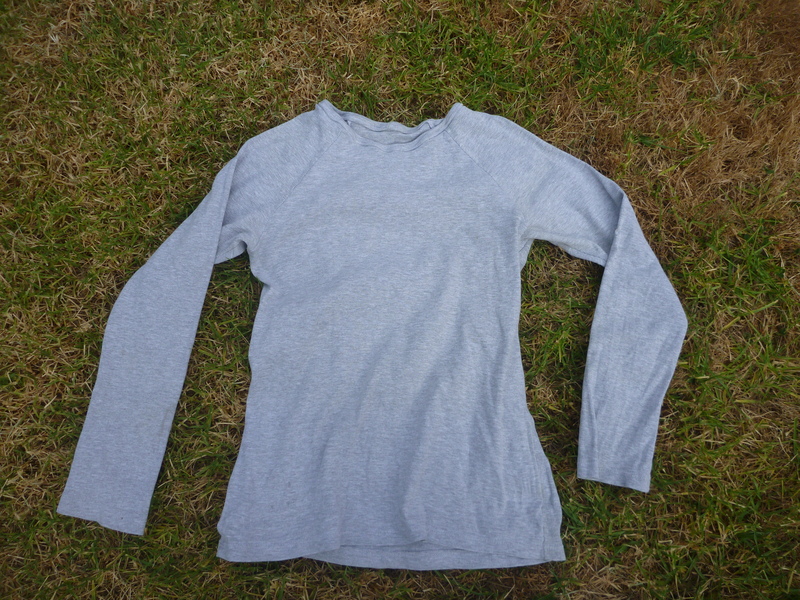 The raglan tee fit nicely, except for the neckline which I stretched out HORRIFICALLY. It makes me very sad. Next time, I need to shorten the ribbing. As I pinned it, I KNEW it was too long, but I sewed it up anyway. If I had trusted my gut, and sewed it at the tension I thought it should be it might have turned out ok. I cut these way too small. Aside from that, they were fine. Just Unwearable. 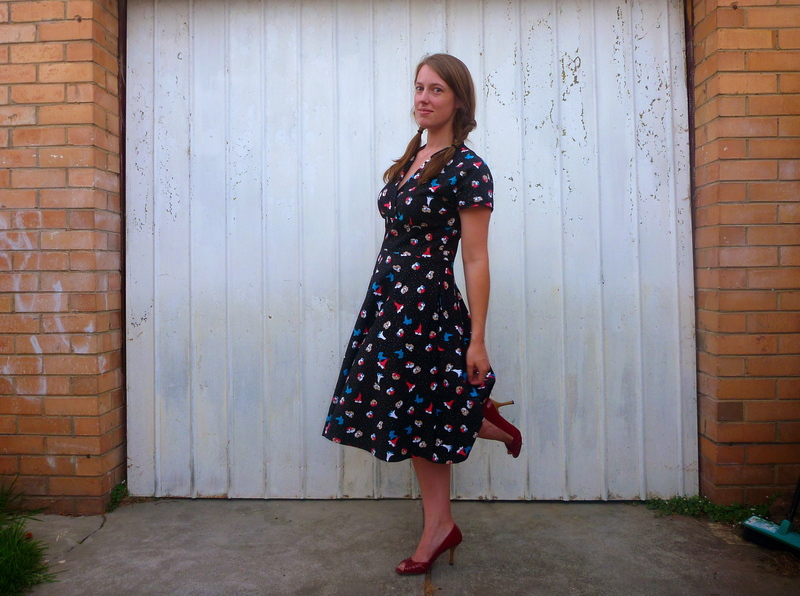 This is the super cute dress pattern by Oliver and S, the Playtime dress which I love, and will make more of, it just needs to not be in this fabric. Blergh. 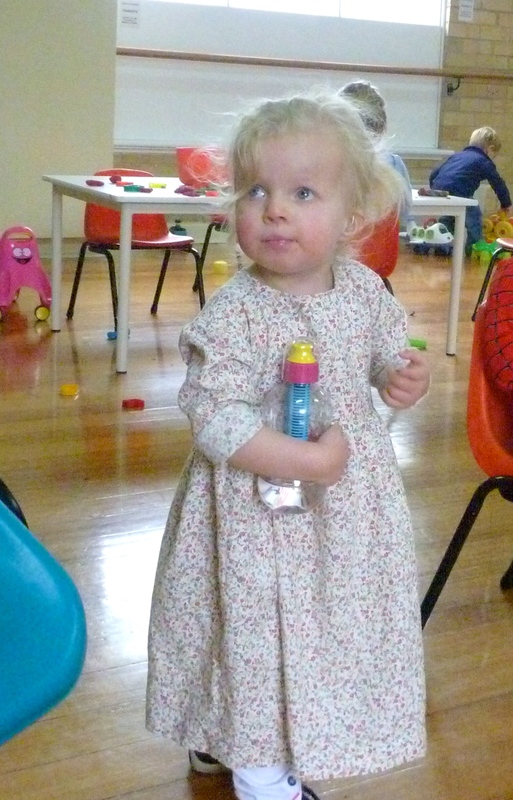 A well made, lovely pattern and I manage to make her look a like a cast member of little house on the prairie. All in all, I’ve learnt from the fails, they weren’t as bad as my fails last year and I’m very pleased with my favourites. What more can you ask for?